Emily Visits Violaland, Part 1/? What do you call someone who hangs around musicians a lot? Why don’t violists play hide and seek? Because no one will look for them. What’s the longest viola joke? Did you hear the one about the violinist who got frustrated arranging music for string orchestra because she didn’t read alto clef, who had some weaknesses in her violin playing that she thought viola playing might solve, and who had a viola-playing friend who she thought might help her navigate the subtleties of switching between instruments? Seriously. I’m not joking. This actually happened. A month or two ago I arranged a piano piece by Amy Beach for my little string orchestra. The two violin parts were a piece of cake, obviously. The cello parts didn’t come quite as effortlessly, but they were still relatively easy; I did play for a year or two in my teens, and although I’m a terrible pianist, I’m fluent in bass clef. But those violas. And that alto clef. I know that technically it’s not possible for clefs to leer, but I swear this one did. It taunted my cluelessness. I might as well be a cipher to you, it said. For all these years, you’ve sat next to violists; learned chamber music featuring violas; heck, worshiped Lillian Fuchs and had the wildly unpopular heretical thought that there are times in her hands that the Bach cello suites sound just as good, if not better, on the viola…and you haven’t even bothered to glance at me, let alone take the time to learn my pitches. You have to go to Wikipedia to figure out what you’re doing when you’re writing notes on me. Wikipedia! You don’t know when you’re asking violists to make inconvenient shifts, do you? – you don’t know how to finger beginner players’ parts, do you? – in fact, you don’t know anything about violas period, do you? You like to think of yourself as a well-rounded musician, but you don’t know a thing about me. Haha. The joke’s on you now, isn’t it, Miss Violinist? Isn’t it? Isn’t it?? 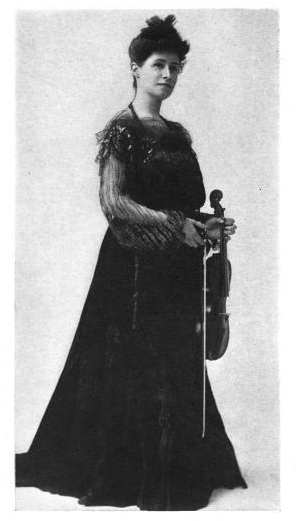 I kept hearing Edith Lynwood Winn’s opinionated turn-of-the-century voice in my head: Every violinist should play the viola to some extent. This aids one to produce a robust tone, and a knowledge of it is very helpful to the ensemble class. In one of those common real-life coincidences that editors view as contrived in novels, the guy who sits next to me in orchestra is my luthier, and he has a shop and rents out stringed instruments. In early December my portable stand broke during one of our gigs (FYI, cold Wisconsin winters + plastic stands + forgetting plastic stands in cars in cold Wisconsin winters = problem), so I emailed him asking if he could bring along a spare stand to our next gig and I’d pay him there. Then, suddenly and on impulse, I tacked on a quick paragraph asking about viola rentals. I asked if he had any available, and if so in what sizes, because with my small frame and chronic pain problems, I’d prefer a smaller one. Weirdly, I didn’t tell anyone what I was doing. I was treating the request like a covert mission. A drug deal. Looking back, I’m not sure if I was keeping it a secret to cushion against disappointment in case it didn’t work out, or whether if deep down all the jokes over the years actually have engendered some anti-viola prejudice in me. I needn’t have feared disappointment. Sure, he wrote back. I’ve got a 14-inch in stock; if you can handle your violin, you almost certainly can handle this viola. $20 a month. Yes, it turns out that for pennies a day, you too can give a home to a lonely viola in desperate need of love and attention. After I heard from him, I started a thread on violinist.com about adding on viola to my musical workload and got some helpful advice (thanks guys! ), the most urgent of which seemed to be, take a lesson from a violist. Yesterday I went to pick the instrument up, half nervous, half giddy. My luthier came in the room with a Hoffman Concert from Shar – a really nice sturdy little thing whose value I would have assumed to be at least four or five times what it actually is. It’s not so bad to look at, either. I wonder if this is just a particularly nice shop and a particularly nice rental, or if cheap stringed instruments have drastically improved in quality since I began playing twelve years ago. He left the room so I could be alone for my big viola debut. I took a breath, raised the bow, and started a scale on the C-string, making sure to relax as much of my weight into the bow that I could. The weeks of waiting were worth it. The tone resonated through my chest, like someone humming very loudly right next to my heart. I remember the feeling of a soothing vibration from my cello days, but this was so much better because it was right beneath the ear, and the tone didn’t take nearly so much effort to draw out. The G and D strings had large, wide, wise sounds. (How can sounds be wise? But they are. I felt like I was listening to a philosopher.) And the A-string! It should basically be the same thing as my violin’s, right? But it’s not, at all; it’s a totally different creature. It’s mellow, mournful, melancholy. Shifts on the A-string just tug at the heart. It’s the stringed instrument equivalent of walking through an animal shelter and seeing dozens of sad eyes follow you around. And there’s no bright silvery quick-vibrating E-string afterward to cheer you up. The mellow, mournful, melancholy A-string is the high point of the viola. It’s the happy part. I’m melancholy by nature, so I loved it. While I was at the shop, my luthier kindly offered a fifteen inch for me to try. Its sound was even bigger and broader, and more (for lack of a better word) viola-ish. But my intonation was dodgier, and it was harder to get a good tone out. Verdict: if I didn’t have chronic pain issues and could have weekly lessons with a well-trained teacher, I would have assumed I’d get used to it and brought the fifteen inch home. It wasn’t unmanageable by any means; it just felt inconvenient. It was heartening to know that a woman who’s ninety pounds and five feet five inches can almost handle a fifteen-inch viola. Something to keep in mind for the future. But for today leastways it would be the fourteen-inch. I signed the papers and away I went. I got home and compared my violin and the viola, both aesthetically and aurally. I spent the whole time playing various excerpts of solo Bach. I marveled at how the same passages could sound so entirely different on the two instruments…and how brilliantly Bach wrote for each range. I ended the session with my violin (I have to let her know she’s still my baby) with a quiet double-stop from the g-minor adagio – D on the A string and open D. I gently raised the bow from the string and let the pitch ring in the air. This was a day well-spent, I decided. Suddenly I heard a strange sound behind me that I’d never heard before, as if there was another player in the room. I turned around just in time to see the D-string on the viola vibrating in resonance. My violin was talking to the viola…and the viola was answering. For a brief moment I got weirdly emotional (it was a long day, okay?). It was touching, and all the confirmation I needed that the two instruments can live happily in harmony. So what have we learned in this installment of Emily Visits Violaland? Lesson Number 1: You don’t need an excuse to try the viola. A simple curiosity is reason enough. Lesson Number 2: Don’t let your size hold you back from at least trying a viola. Lesson Number 3A: The viola is amazing. The melancholy of the A-string may lead to dysthymia, but it’s amazing. Lesson Number 3B: Refuse to listen to Edith Lynwood Winn at your peril. PVF makes his first appearance and offers wisdom from the rarefied world of professional viola-players. Winn (1868-1933) was a turn-of-the-century writer, violinist, and pedagogue. She had a lot of opinions, and she took great joy in sharing them. Her books include Violin Talks (1905), How To Prepare For Kreutzer (1910), How To Study Fiorillo (1910), and The Etudes of Life (1908). I just stumbled upon them yesterday by accident. Winn sidetracked me with her authoritative voice, and ever since I’ve been reading her highly entertaining work in my spare time. I know relatively little about her besides what she reveals in the books. She apparently studied in Europe (as almost all serious musicians did in those days) – once had a nervous breakdown after practicing too hard for too long – taught in public schools and colleges – lived in Boston – studied with Julius Eichberg, a Boston-based teacher who taught many great female violinists – and had “unfortunate fingers”, in particular an obnoxiously short fourth finger (just like me!). She sounds like a very interesting, strong-willed lady, and even when I oh-my-gosh totally absolutely 100% disagree with her, I still find I Can’t Stop Reading Her. Here are some excerpts from Violin Talks. Children’s work in America has been as yet an experiment and is not based on psychological and pedagogical training such as teachers in the public schools are obliged to receive before they are entrusted with the education of the young. The theory that “any teacher is good enough for a beginner” is fast becoming null and void. There must be teachers trained for children’s work. They most love this preparatory work. They must be willing to serve art from the beginning of child training. Such teachers are born and not made, and yet their preparation for teaching must be broad. They must know violin literature; they must love children and be able to meet the child on his own plane; they must be unselfish, consecrated, thorough. Above all, they must be able to produce a beautiful tone, – the first model which a child hears. The teacher should possess a winning personality. The child should be obedient, respectful, prompt, and willing. The German child always comes to his teacher with a “good morning” and a hand-shake, but he stands somewhat in awe of his master. Teacher and pupil can be sympathetic without seriously interfering with the dignity of their relation. The nervous and high-strung child suffers under severe teaching. In general, if a pupil has worked hard for eight or nine months without interruption, he should have a vacation during the summer, and he will begin with more freshness and vigor in the fall. I believe that ear-training should go hand in hand with violin study. It is unfortunate, indeed, that the public schools of every town do not afford some musical training for children, but it is only in the average large town and city that there are trained teachers of music who direct and supervise the study of music through the various school grades. The consequence is that music teachers have to do more real drudgery than they should, and they are also compelled to teach ear-training, time values, and many other things which students ought to have learned long before. Many people ask at what age a child should begin violin study. This depends upon the constitution and taste of the child, and upon his musical environment. It is better to begin at fifteen years of age with a competent teacher than to begin at seven with an inferior teacher. If there is no fine violinist in the town, let the child begin piano study with some good teacher, for piano teachers are more easily found. At the proper age let the child go to the city for violin lessons. Country and city standards differ. Country teachers, because of little competition, are prone to advance pupils too rapidly. The thoroughness with which the best city teachers work is an evidence of high standards. A faithful study of the first position requires two or three years for the average child. Every violinist should play the viola to some extent. This aids one to produce a robust tone, and a knowledge of it is very helpful to the ensemble class. It pays to be broadly educated. It makes us richer. It makes the world richer. It helps us to be happier. The man and woman who intend to devote life to the profession of violin teaching, or concertizing, cannot be too well educated. Many piano pupils use a metronome for daily practice. Let the violinist use his brains. “Rag-time” music is the very enemy of careful reading, attention to rhythm, and the cultivation of the highest in music. It develops inexcusable laziness in pupils, and the teacher has to undo a host of faults which could be avoided if parents only knew them to be positively the result of the “rag-time craze,” and would forbid it. This would save hard work on the teacher’s part, and much sorrow on the part of the pupil. A certain pupil has an over-emotional temperament. She even plays unrhythmically. A year or two of ensemble work will aid her greatly. Another pupil suffers from the effects of overpractice. She also plays unrhythmically. Rest is her only cure. If I were the mistress of a home I should teach every child to recite poetry. The child who cannot feel the rhythm of poetry will not feel it in music, but he can cultivate both. I should allow him to dance. From his earliest years he should sing child-songs. When he is older let him study the languages and learn to scan Latin. Our greatest musicians are fine linguists. Few girls can practice over four hours daily. Common sense and physique forbid. Naturally a girl has more supple fingers than a boy. She also has a fine command of her upper notes on the E string, for her fingers are small, delicate and agile, but she has no the endurance of boys. She can play, and play well, but she must keep her health and practice only as much as she can endure. The effects of overwork are spasmodic movements of the body and face, nervous bowing, and unsteady tone, affectation, and absence of rhythm. This, added to a poor sense of pitch, which often accompanies nervous troubles, is a serious detriment to success. Life is too short and too full of meaning for us to cripple our energies by overwork. The violinist should keep his energies normal. From the first the violin should be a good one. There is no inspiration in a bad violin. Not everyone can have a good, or, rather, a valuable violin. Everyone can have a violin correctly made. The violin should go to the repairer at least once a year. The bow should be rehaired as often as necessary. Mine goes to the shop three times a year. Both violin and bow should be kept very clean and free from excess of rosin. Many students permit rosin to accumulate under the bridge. That is dangerous. Rosin injures the varnish, and dust-particles spoil the resonance of the violin. One can wash the bow with good soap and water and a little ammonia. Two or three half-hour lessons a week are sufficient for the average intelligent boy or girl. It is well to have someone at home supervise the daily work of the child, but that person shuld attend the lessons with the child. I don’t know why it is, but violinists are very often quite sensitively organized and delicate. One or two hours of daily practice is the most the beginner should undertake. I regret a year of hard work at six hours a day of practice. I paid for it by a nervous collapse. I have often said that pupils should devote from fifteen to thirty minutes daily to scale practice; then they are not hampered by technic, as in Etude work, and, because the mind is concentrated one one thing, there is no excuse for faulty position. The prevailing “bad point” of new pupils is that the left elbow is not well under the right side of the violin, thus compelling the hand to tilt to the left, the thumb to cling too closely to the neck of the violin, and the whole arm to be changing its position constantly. There can be no progress with such a position, for intonation will never be correct, and technic, as well as a command of positions, is out of the question. Teachers who neglect these points do so at the risk of their own musical reputation. Speaking of fingers, many violinists have most unfortunate fingers. I am one; my fourth finger does not reach to the last joint of my third finger, and in the higher positions, my thumb sometimes clings to the body of the violin, instead of to the neck. I have found, however, that persistent practice in the positions, with my fingers (on the E string) a little inclined toward the left, aids my thumb, while raising the hand and running the elbow very far under the violin permits the thumb to regain its proper position. And now we must labor to obtain a normal position and as little extra movement with arm and hand, for all unnecessary movements cause great uncertainty and loss of security and time. A prevailing fault is that of grasping the violin too tightly with the chin. The violin should be held by the left side of the jaw and not by the chin, which should rest upon the instrument at the left of the tail-piece. There are many methods of holding the bow, but there is only one way of holding the violin – and that is the right way, – free and beautiful. Now that I have spoken of the position of the body, it may be well to remark that young students should try not to move about much while playing. Paganini indulged in many contortions of features and of body, but his day is past. Many violinists sway the body to the rhythm of the music. It is, indeed, very hard to stand perfectly erect and motionless. The great artist is very full of moods, and he responds to the spirit of his music to such an extent that he is prone to move his body as he plays. And these excerpts are only the first thirty-odd pages! She has much more to say throughout the rest of the book. So what do you think? Anything in there that leaps out at you as being incredibly relevant? Incredibly irrelevant? Good advice, bad advice, advice you can’t make heads or tails of? Winn’s books have made me wonder, what will teaching be like a hundred years from now? What conventions of today that we take for granted will tomorrow’s students laugh at? Which of Winn’s ideas are due for a come-back (personally, I love the ideas of mandatory ear-training and viola-playing)?